Get the advanced, modern dental care that you need to comfortably achieve the smile you’ve always wanted at O Dental. With state-of-the-art equipment, your dental procedures are more efficient and effective than ever! Computer-aided design/computer-aided manufacturing, or CAD/CAM, is used only by a few dental practices. 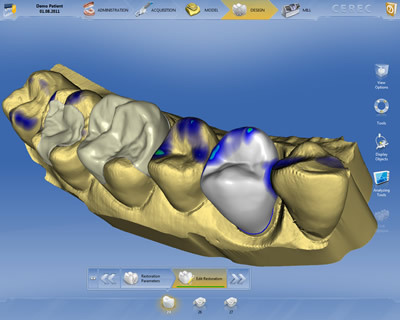 This cutting-edge technology allows your restorations to be created with computerised software. We’ll take scans of your teeth that are used to create your restoration. Everything is completed in a single, convenient appointment using excellent materials. The on-site digital OPG (orthopantomogram) machine at O Dental uses minimal radiation to ensure your safety. Digital intraoral radiographs are also available. The X-ray machine is linked to our computers, allowing the images to be viewed immediately. See your before-and-after photographs for Invisalign® and cosmetic work with digital photography at O Dental. The preferred treatment is selected, and the specifics are then sent to our reputable Australian-based laboratory for optimal aesthetic results. Our team is constantly updating their techniques and equipment to deliver the highest levels of treatment for every patient. Nearly all restorations are done under a rubber dam that protects your porcelain restorations and fillings, increasing their longevity. Every material is carefully selected for each individual to mimic the appearance and function of natural teeth. Are you wondering if we could help you achieve the look you want? Contact us today and book a time for a cosmetic consultation!